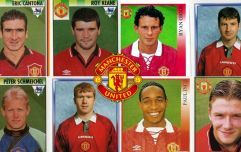 Manchester United dominated the first half against Tottenham Hotspur on Sunday evening, but had goalkeeper David De Gea to thank for keeping a clean sheet as they held resolute to take home all three points. De Gea made 11 saves in the match - three short of the Premier League record he set at the Emirates Stadium during United's 3-1 victory over Arsenal in December 2017. The performance exemplified why the Spaniard is so important to his team, and why they are so desperate to secure his services for the future. United activated De Gea's contract option at the end of last year, automatically extending his contract for a year. His performance at Wembley was compared with that of Spurs goalkeeper Hugo Lloris on Match of the Day 2 by pundit and former Spurs midfielder Jermaine Jenas. Using two very similar examples - one being United's goal from Marcus Rashford and the other being a Harry Kane shot saved without fuss by De Gea - the former England international highlighted what separates generation-defining goalkeepers like De Gea from good ones like Lloris. 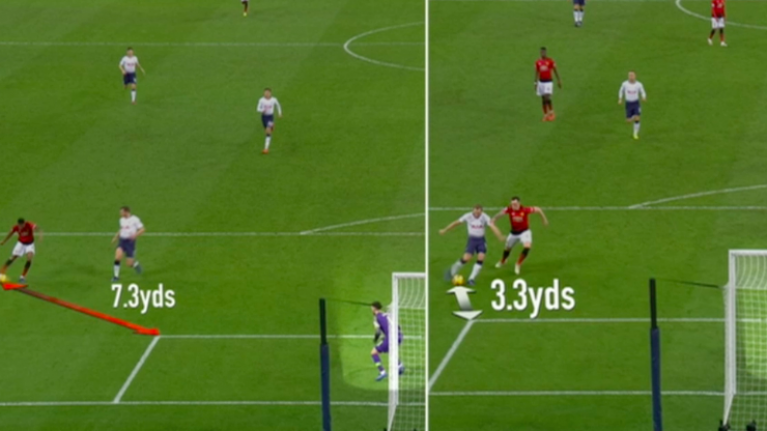 In one section of the analysis, the screen is paused showing Rashford and Kane both shooting, with each striker 7.3 and 3.3 yards from the corner of the six-yard box respectively. 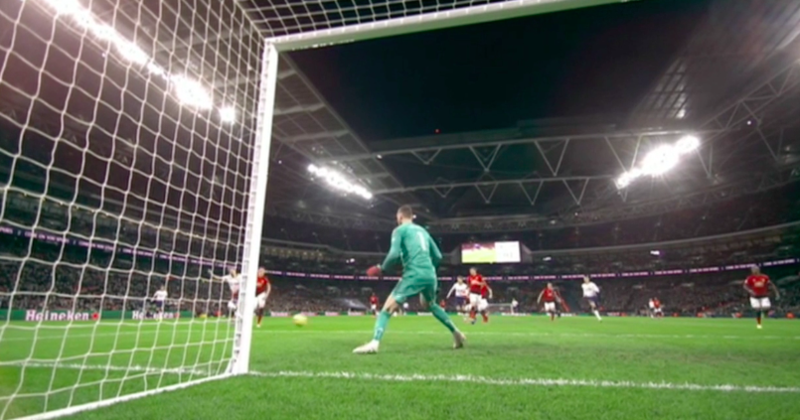 But while Lloris was purely covering his near post and actually standing outside of his post, leaving the far side into which Rashford would eventually score exposed, De Gea made sure to position himself more centrally, ensuring that he can cover the other side of his goal more comfortably. This is proven by the manner in which De Gea saves Kane's shot, pre-empting the area that the England star is going for and making it look - through his positioning - that the ball is coming straight at him. It seems like a little thing and is made to look easy by De Gea, but this analysis points out that it is the sort of thing that makes him look as effortlessly good as he regularly does.